Are you breathing in Mold and Bacteria? - Prevent Mold and Bacteria Build Up. - Maximize Your CPAP's Effect by Ensuring Clean Air Ways. - Reduce Chemicals Needed For Cleaning. - SAVE TIME! One easy pull cleans the whole tube! - Made To Specific Dimensions to Maximize Cleaning for Standard 22mm diameter CPAP Tubing. - Kink proof stainless steel life time guarantee handle is designed to be super gentle and flexible and will not damage your cpap tube. - Includes a Sealable Plastic Bag to Keep The Brush Clean and Safe. Will Pay For It's Self In Time..
- Keep your Tubes Cleaner for Longer, Reducing the Need to Replace Them as Often. Note: This is a NEW addition with limited-time pricing and a limited quantity. At any time we may run out of stock or the price may increase. Act Now to Claim Today's Limited-Time Price and Save! Click "Add to Cart" Now & To Breathe Cleaner Fresher Air - 100% Satisfaction Guarantee! An essential part of your CPAP Machine Cleaning Tool Kit - Promotes a cleaner healthier bacteria free air breathing experience. 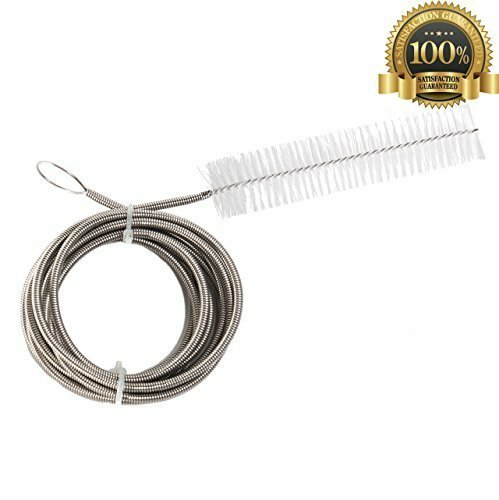 Save time by efficiently cleaning your standard 22mm CPAP tubing in one pull. Results in cleaning your tubing more often with less hassle. Save Space - Super flexible Kink Proof stainless brush handle coils up tight and easily into included plastic bag and takes minimal storage space. If you have any questions about this product by Clair Devices, contact us by completing and submitting the form below. If you are looking for a specif part number, please include it with your message.